New factory original Upper radiator hose for Prowler. 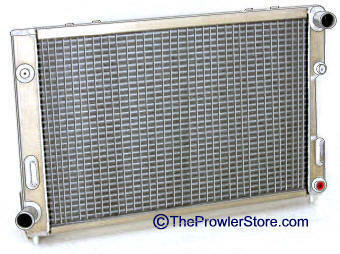 New factory original Lower radiator hose for Prowler. 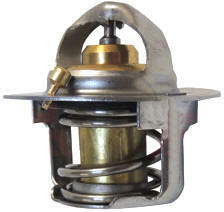 New factory original radiator overflow tank cap. Chrysler factory original OEM part. Thermostat. Fits exactly as the factory fan. 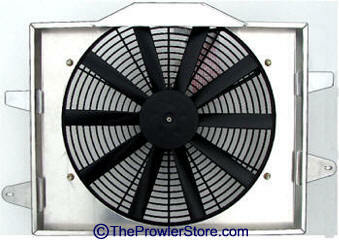 We now offer the complete Prowler fan shroud, high powered fan and motor in all aluminum. 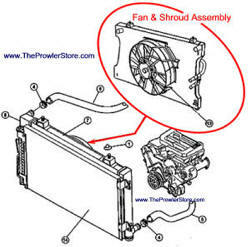 Because the Prowler stock fan shroud, fan and motor are no longer available from Chrysler or any other company we have duplicated it. Fits just like the original factory fan. Same connection points, we provide you the parts to connect to your factory stock electrical plug. 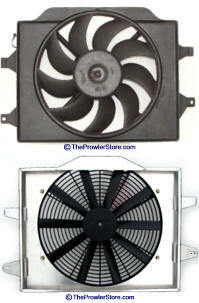 Our one speed fan funs faster longer for better cooling. This assembly is a direct fit, no modifications are necessary. Factory diagram Factory fan on top, our fan on bottom. Same connection points. Drop in for a Perfect Factory Fit! Sturdy ALL Aluminum! High Output Fan. 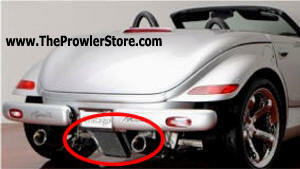 Don't be fooled by other brands which say they may fit a Prowler - They won't! Fits exactly the same as the factory original! Direct drop in easy fit! Fits just like the factory radiator! 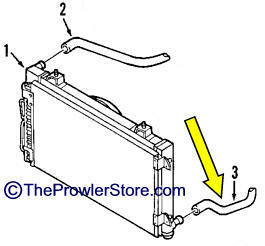 Prowler Radiators are No longer available through Chrysler. 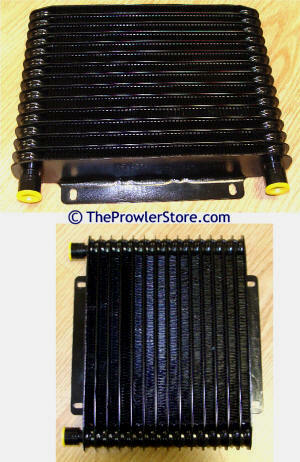 No other company makes a drop in radiator for the Prowler. Ours is super high quality ALL Aluminum and a direct drop in fit and Includes a higher capacity cooling reservoir for higher heat extraction. All aluminum and a direct fit with no modifications necessary. 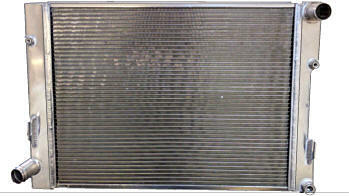 High quality radiator made specifically to fit and work on the Chrysler Plymouth Prowler. All Aluminum highest grade of material are used in our production to ensure product longevity. All professionally welded construction. No screws, no plastic. for a easy / perfect factory fit. Don't be fooled by "Spectra Premium" and other brands which say they may fit a Prowler - They won't! 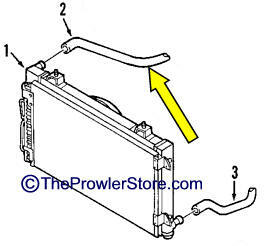 Chrysler factory Transmission cooler radiator located under the rear bumper. These are being discontinued get them while they last.